New and the perfect accessories for the woman in your life are mobile products by Jellyfish. These fun covers and chargers can be personalized by color, design and style; they are great quality and absolutely adorable! I was given the opportunity to put a few of their new items to the test and each one was great! The Gem Set Case available for Samsung Galaxy S4 and Apple iPhone 5S retails for $32.99 and is made of soft and squishy gel tiles. The protection is perfect and I love the screen cover it came with (no bubbles like others sometimes cause). 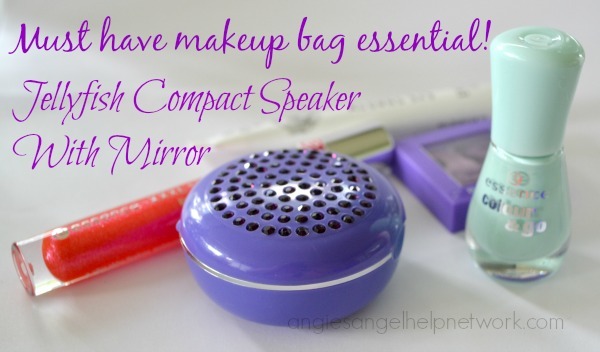 Completely fashionable and perfect for a lady's desk at the office is the "mirror compact" universal speaker. This totally jeweled out and super light USB speaker provides super sound from such a tiny size (fits in your pocket). The speaker retails for $34.99 and comes in bright green, purple, turquoise and magenta. Most recently, the Jellyfish released a new line of products, as well as re-launched their ecommerce website where all of their amazingly affordable accessories are available for purchase. “Jenny and I are so excited to have this opportunity to debut our products” said Co-Creator Silvia Smith. “Smartphones have become an extension of ourselves so why not use them to express your style and personality? And why not change out your phone’s look like you would handbags, shoes or jewelry? We wanted to bring to life accessories that transform the look of your phone and that could be coordinated across the line. Fashion is fickle and always evolving which is why we do our best to keep up with the hottest trends and design our products so they will be relevant for a long time. We are 100% focused on making sure we offer something for the fashionista in all of us.” The new line brings accessorizing to a whole new level by offering a collection of coordinating products in delicious colors and sassy styles allowing individual personalities to shine through via technology! JellyFish Is A Summer Must Have Tech! Their line consists of cases, chargers, speakers/ear buds, makeover kits, and phone accessories. The Jellyfish full line can be personalized with sassy colors, cool textures, and fun designs. The two products I had the pleasure to review are the JellyFish Mirror Compact Speaker in the color purple and the Jellyfish Tune Bud! Ear Buds with a Jelly Clutch in the color pink. The Jellyfish Mirror Compact Speaker is a bejeweled, lightweight USB plug-in speaker that gives off a big sound for its compact size. It also has a mirror, and can open and close like any other pocket sized compact mirror. This is the coolest speaker I have seen, it’s a 2-in-1! An awesome compact mirror, that is also a cool mini speaker. It’s great for small parties, like sleepovers, little get-togethers and a must have in every girls makeup bag. The sound quality is pretty decent, loud for it’s size. With the amazing electronic gadgets nowadays, it's simple to purchase what you want, when you want. And, with ever changing technology, elements like sound and adequate battery power have greatly improved. Jellyfish offers really cool tech products for the pre-teen/teen set. They sent my girls earbuds and portable chargers to test and have hit a home run! They offer all the products the young ones of today love; phone accessory, audio, and power collections. My daughters love the vibrant, fun colors and chose "Bodacious Blue" to fit their personalities. Before I could blink, all the items were out of their packaging and put to use. DIY Project, Gardening and My Must Have JellyFish iPhone Case + Speaker!